Ruthenium (Ru) has received great interest in recent years for applications in microelectronics. Pulsed laser deposition (PLD) enables the growth of Ru thin films at low temperatures. In this paper, we report for the first time the characterization of pulsed laser deposited Ru thin films. 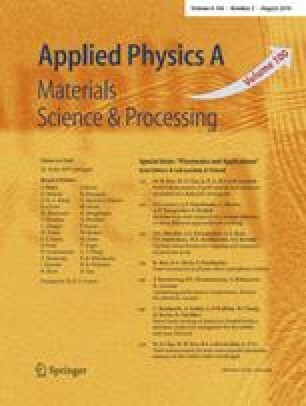 The deposition processes were carried out at room temperature in vacuum environment for different durations with a pulsed Nd:YAG laser of 355-nm laser wavelength, employing various laser fluences ranging from 2 J/cm2 to 8 J/cm2. The effect of the laser fluence on the structural properties of the deposited Ru films was investigated using surface profilometry, scanning electron microscopy (SEM), and X-ray diffraction (XRD). Ru droplets, some spherical in shape and some flattened into round discs were found on the deposited Ru. The droplets were correlated to ripple formations on the target during the laser-induced ejection from the target. In addition, crystalline Ru with orientations of (100), (101), and (002) was observed in the XRD spectra and their intensities were found to increase with increasing laser fluence and film thickness. Grain sizes ranging from 20 nm to 35 nm were deduced using the Scherrer formula. Optical emission spectroscopy (OES) and energy-dispersive X-ray spectroscopy (EDS) show that the composition of the plume and the deposited Ru film was of high purity.